Natalia of gatti fili e farina chose Gingered Carrot Cookies for TWD— an overlooked recipe whose time I’m glad has come. These cookies are full of tasty bits and are just sweet enough. At first glance, the recipe looks like it might make carrot cake in cookie form. Shredded carrots and coconut, raisins, ginger and pecans…I was certainly surprised to see mine bake up as little hearty, lumpy-bumpy mounds instead. Dorie says these are scone-like, and she’s right (of course she is– it’s her recipe afterall). If I’d thought to scoop out a couple of triple-size ones, I bet they would have made a great breakfast! For the recipe, see Baking: From My Home to Yours by Dorie Greenspan, or read gatti fili e farina. Don’t forget to check out the TWD Blogroll! They were a fun cookie. We loved them and will make them again soon. Beautiful cookies. I almost made them a bit larger; will try that next time. I like your idea about serving them for breakfast. I may have to eat my small ones for breakfast, but you are right, bigger would have been better! I loved these and yours are very tasty looking. I really thought we were making carrot cake cookies. It was a nice surprise to try something just a little bit different! “Lumpy-bumpy mounds” is a great way to describe these cookies and my hips too after I practically ate all of them. Your “simple” picture is amazing. I missed that part about the scones. Bet they would be tasty for breakfast. Yum! They look delicious! And I am drooling over that semifrido below! WOW! Loving the way your cookies came out Steph. So rustic and delicious. I can confirm, a good breakfast indeed. Nice pics. Yep, triple size sounds just about right 🙂 Love the lumpy-bumpy descriptor – that’s these cookies to a T! 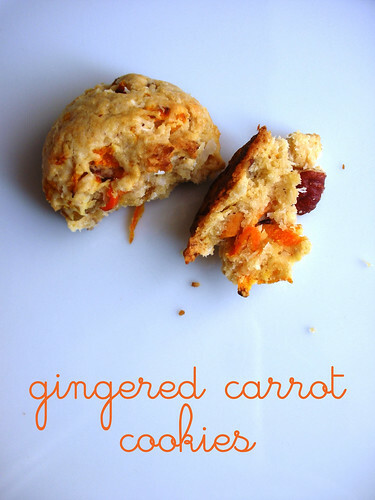 Love the nubby texture of these cookies with all the carrots and nuts sticking out! Ciao Steph !Thank you for joining me this week I’m really glad you loved these cookies ! Yours look great !! These were great, weren’t they? I wish I had thought to save one for breakfast as well, or maybe I wish you had saved me one of YOURS for breakfast! When I first saw your photo, I thought it was a carrot cake in cookie form too, but a carrot scone certainly sounds very good. I think they were very scone-like and would hold up on their own as scones. Yours are puffy like mine are. They look great! These would be great at breakfast, but I had mine with tea. That was good too! Lovely pictures. interesting.. it’s like carrot cake but …. cookie. These could easily pass as breakfast cookies. Well, if I hadn’t glazed them and filled them with cream cheese frosting. Yours look beautiful! I like where you are going with the triple size. And for breakfast. Oooh, I think I’m going to have to make these ASAP! I’m all for anything with ginger and I love desserts involving carrots. And I agree that these could be gobbled up for breakfast 🙂 So pretty, too! These do look like they’d be great for breakfast! I love your idea of serving them for breakfast – perhaps psread with cream cheese, just like a mini carrot cake. So lumpy, but so good! I loved everything in these cookies – and yours looks fabulous! Mine didn’t last long enough for breakfast – but so glad “someone’s” did – nicely done – they’re beautiful! They do look great! And I love the idea of making them bigger. Maybe patting them into a circle and cutting out scone shaped cookies. Yum! I think I might try these (any excuse for cookies for breakfast), though I’m thinking I’ll probably swap the raisins for some dried cranberries, but that’s just me. Looks good! Oooh wow these sound different, i bet they were yummy! Perfect for breakfast.